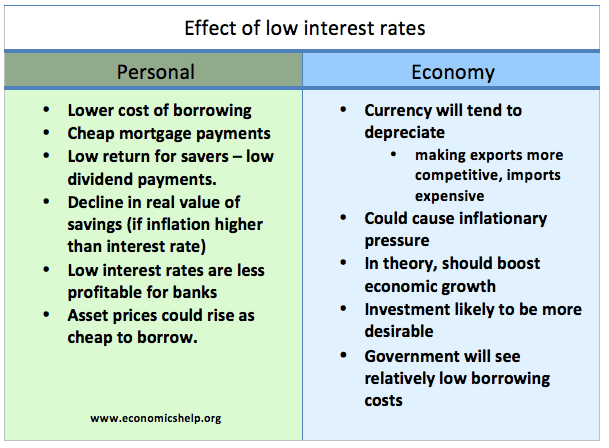 Home > Economics help blog > interest-rates > Who benefits from low interest rates? When interest rates were cut to 0.5% in March 2009, few would have predicted that interest rates would have stayed low in UK, US and the Eurozone for so long. Interest rates have stayed at zero for several years – defying several predictions that they will rise soon. Who benefits from low-interest rates and who loses out? The big winners from a period of low-interest rates are homeowners who are paying a variable mortgage. Firstly, low-interest rates will lead to lower monthly mortgage payments for homeowners. Mortgage payments are often the biggest component of homeowners spending. 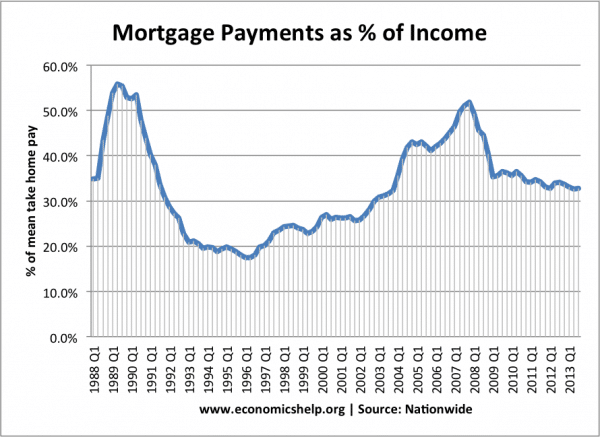 The fall in interest rates means the average cost of paying monthly mortgage payments is relatively low. It is not just homeowners on variable mortgages. The prolonged period of low-interest rates means that fixed-rate mortgages will also become relatively cheap. In 2009, the FTSE 100 fell to below 4000. During the past 7 years of low-interest rates, the FTSE has risen to over 6000. Share prices are affected by many factors, e.g. prospects for economic growth. However, in a period of low-interest rates, savers often look for a better rate of return. In this period, assets like shares become relatively more attractive and people will buy shares which offer a better rate of interest than saving in a bank. The period of low-interest rates may have helped boost the price of shares, bonds and assets. Low-interest rates have reduced the relative cost of interest payments on government debt. 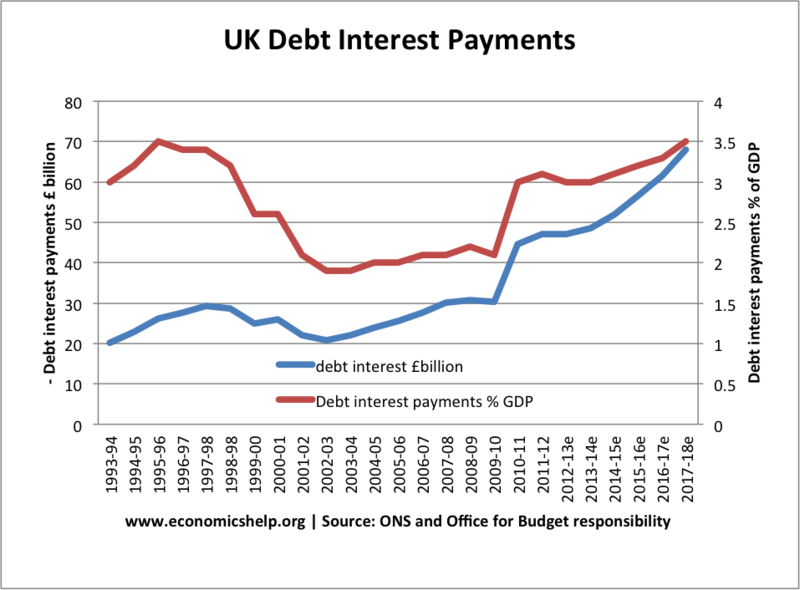 Given that public sector debt has risen significantly in the past six years, this lower cost of servicing debt is important for the relative cost of interest payments. The period of low-interest rates makes investment financed by borrowing more attractive. With lower interest rates investment gives a relatively better rate of return because the cost of borrowing is low. At a low rate of investment, more projects will have a rate of return higher than the cost of borrowing. Who loses from low-interest rates? 1. Savers. With low-interest rates, people saving money in a bank gain lower interest rate. For example, pensioners who are relying on interest payments for income will see a fall in relative income. 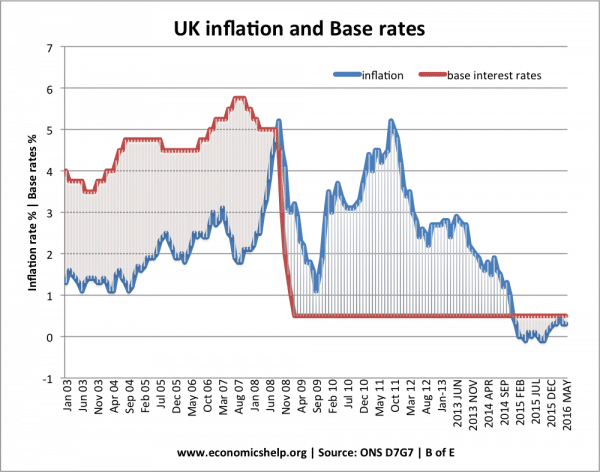 An important issue for savers is the real interest rate – interest rates – inflation. 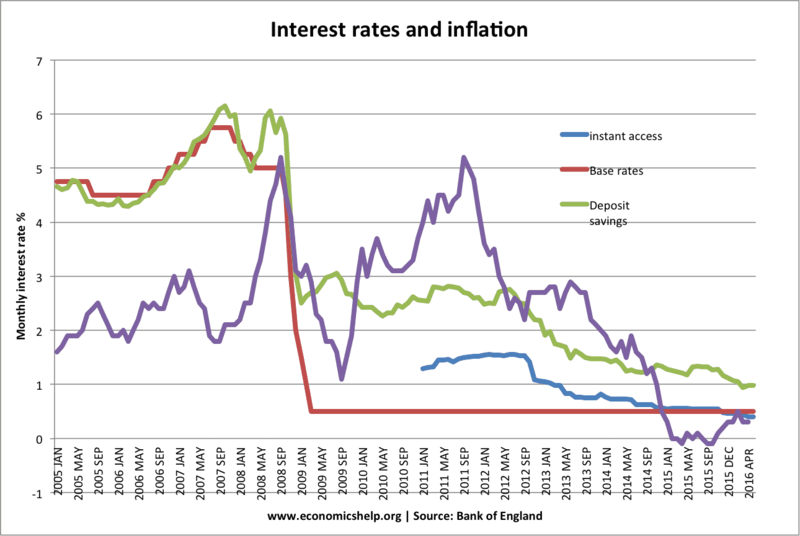 If inflation is higher than nominal interest rates then savers will see a fall in the real value of their saving. During the great recession of 2009-13, inflation was mostly above base rates meaning that savers were hit by both low-interest rates and high inflation. 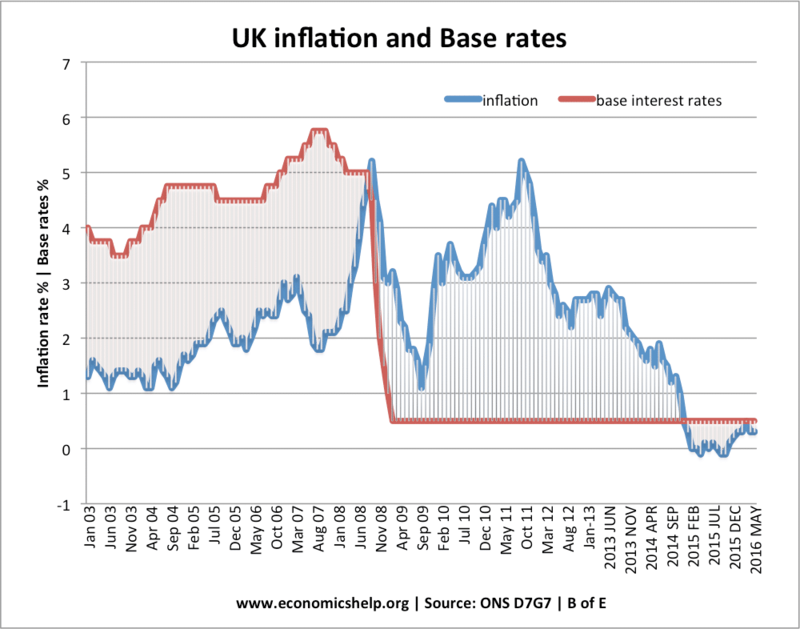 In 2015, inflation fell to 0% below base rates of 0.5%, meaning real interest rates have become positive. Bank rates vs base rates It is worth pointing out that although bank base rates have been 0.5% – commercial banks have offered better rates for savers – to attract deposits. Therefore, savers often get a better return than headline base rates indicate. The above graphs show that savers who put money into a fixed rate savings account received a better return than the official base rate – though the gap between base rates and bank rates has fallen in recent years. Wealth effect. Savers who have money invested in investment trusts may get a lower interest payment, though as a compensation they will have benefit from rising asset prices / rising share prices / rising house prices. A big loser in a period of low-interest rates is first time buyers and renters. Low-interest rates have been one reason (though not the only one) causing rising house prices and rising rents. Despite mortgages been relatively cheap, the high cost of buying a house and deposit required has meant home-ownership is unaffordable for many young people. Do banks benefit from low-interest rates? 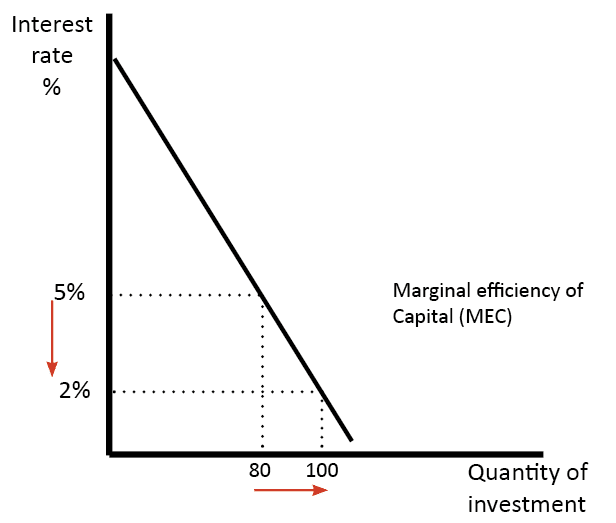 One problem for banks is that a period of low-interest rates tends to reduce their profitability. With low-interest rates, banks can charge lower rates for lending. But, they cannot charge negative interest rates on deposits. The period of low-interest rates has reduced the margin between bank deposit rates and bank lending rates. This entry was posted in interest-rates and tagged interest rates. Bookmark the permalink. It’s great that you’ve mentioned how commercial banking offers better rates for savers, which is a good way to attract deposits. My friend is thinking of putting up a business but he isn’t sure if he should get another account for it, as he mentioned that he will use his money for its operations. I’ll mention this to him and hopefully get him to start with opening a commercial account on top of his personal one.